(Washington, DC) – The U.S. Senate today unanimously approved a resolution introduced by U.S. Senators Jeanne Shaheen (D-NH) and Lindsey Graham (R-SC) affirming U.S. support for the sovereignty, independence, and territorial integrity of the country of Georgia and calling upon Russia to remove its occupying forces from Abkhazia and South Ossetia. Shaheen and Graham have been leading the effort in the Senate to strengthen the U.S.-Georgia relationship. The two currently co-chair a bipartisan task force on Georgia, sponsored by the Atlantic Council, which was launched on the second anniversary of the Russia-Georgia war and aims to encourage a bipartisan consensus on policy toward Georgia. As Chair of the Senate Foreign Relations Subcommittee on European Affairs, Shaheen also convened a hearing on the situation in Georgia on the first anniversary of the Russia-Georgia war in August 2009. Usually movies about war are just collections of special effects, cool weapons and fights. 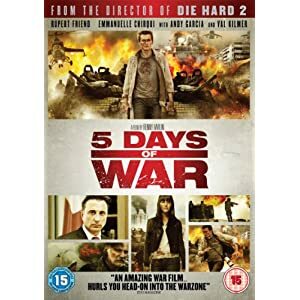 This movie has it all, but great thing about this movie that it very precisely conveys the key idea of this short, but bloody war in August 2008 - Russia tries very hard to hide every evidence, every fact of what was happening in reality during this war. Occupation, mass killings of Georgians, torture and looting. First, the movie is very accurate in showing the sequence of events, exactly as they were happening. If you followed news that days, you could easily see that. This is the first thing Russian official propaganda machine wants everybody to forget. Second, the movie shows real people who lost their family members, sons and daughters, fathers and mothers in this war. This is scary, but watch the movie till the very end and you won't stay indifferent. You will just feel emotions, true emotions, true pain of these people and you will cry... This is so painful. Third, the movie does a good job showing Georgia, landscapes, churches, places and sights...showing Georgian people. It should be interesting for those who never been in Georgia as they are not many modern movies about Georgia. War is not the best time to depict the beauty of any country, but still, the movie captures it quite well. Finally, as I mentioned the movie plot is built around the main idea of this war - Russia tried very hard to hide everything about this war, about massacre they arranged in Georgia. War started same day as Olympic games and movie reminds us about it. Five journalists were killed by Russian occupation troops and this is another fact - Russia was hunting journalists more than anybody else during this war. Don't fall in the trap of KGB propagandists - watch the movie till the end... see these people, look into their eyes, listen their short stories... The truth will ALWAYS find its way out. Collapse of evil Soviet empire confirmed that 20 years ago. Collapse of evil Putin's empire will confirm it again.. very soon. To order this movie in US, read my post here. Keep in mind that the movie DVD is coded as 'region 2', so you won't be able to watch it straight on your regular dvd player bought in US, unless is reads 'region' 2 (European) DVDs. Phillips DVD players usually do. OR just watch this DVD without any restriction on your PC or laptop. It should work there without a problem. Daro Sulakauri , 26, is a freelance photographer in Tbilisi, Georgia. She graduated from the International Center of Photography in 2006. She was chosen by Photo District News as one 30 new and emerging photographers to watch in 2011. Her conversation with Kerri MacDonald for the Turning Point series has been edited and condensed. Tell me about this picture. How did you take it? I was doing a story about a settlement of Chechen refugees in Georgia. They all came to Georgia to escape the war [in Chechnya]. There are approximately 2,000 people there now. They’ve lived here for a long time now and they don’t have any documents. There’s no work, so it’s very hard. I was with them for about half a year. They have this festival called Independence Day; the day when they escaped the war and came to Georgia. The tradition is to take toy guns and the little kids shoot at each other. This kid was pointing the gun, playing around. It was raining very hard. I realized the mountains and everything were in the background. I saw this. That’s when I took the photo. It really shows the moment. They all experienced this when they were little and they play it out themselves with these guns. This picture tells a lot about the people there. It tells the history: this gun and this horse and this young generation, and what they experienced when they were growing up in this isolated village. How has it changed the way you work? I don’t really look at pictures too long when I shoot. I go with the flow. Whatever I feel at the moment, that’s how I react. It was later on that I decided that this picture was the leading picture of the series ["Terror Incognita"]. It showed everything. I didn’t know it at first. I don’t like to put weak pictures in a series. I want all the pictures to be strong and tell the story. When did you first see this image? Maybe 10 years ago. Growing up, I experienced the civil war in Georgia. When I saw this image, I was astonished that he could get so close at that moment. I saw other Capa photos, but this one was the best for me because he was inside the situation. How do you try to bring this into your own work? To not be afraid to get close. As he says, “If your picture isn’t good enough, you’re not close enough.” This image represents that quote for me. Traveler and Blogger Ethan Martin: Tbilisi "may be the most beautiful city I've laid eyes upon"
On the eastern shore of the Black Sea there is a long beautiful beach, not of sand but of smooth gray stones. It's well over a mile long, and it's where I'm sitting in the early afternoon, enjoying a beer and a quick visit to Batumi, my second and final stop in Georgia. I haven't seen a beach like this, or more importantly heard a beach like this — the sound of the waves raking the stones back and forth is supremely soothing — for about seven years, when I spent a couple days in Nice. Sitting in the sunshine listening to the stones roll over each other is just one reason I wish I could stay longer in Georgia. It was only three days ago when I arrived in the capital of Tbilisi by overnight train and just last night when I left. I have an appointment in Istanbul that I can't afford to miss. The capital may be the most beautiful city I've laid eyes upon. Ancient churches with octagonal towers look over the city from hills and ridges that offer a full panorama from along the crenelated walls. The city has cafes on thin cobbled streets in old neighborhoods along the winding Kura river, naturally heated sulfur baths covered by brick domes, and a high saturation of beautiful apartments and residences that are almost Tuscan with their bright smooth facades, arched windows and orange tiled roofs. Things are cheap in Tbilisi, and quality is high. The beer, the wine, the hearty food, the cozy apartment-sized hostels, the transportation. A subway ride is about 50 cents (though pricey compared to Baku, Azerbaijan) and gets progressively cheaper with each ride in a day. Just outside the city, accessible by shared minivans found in a hectic market, are some great day trips. There's Gori, the coincidentally named hometown of Joseph Stalin, and site of the museum in his honor. I sat in his personal train car, formerly belonging to Russia's last tsar, Nicholas II. The small city also saw some action in the recent conflict with Russia, and now has an EU Monitoring Mission office there. There's Mtskheta, home of Georgia's most important cathedral and an ancient hill-top monastery that gives a fantastic view of the city nestled into the confluence of two rivers. I'm normally not very impressed by churches, but the thousand-year-old cathedral is truly stunning. My good luck at arriving in the middle of some sort of rite helped the favorable impression: incense wafting from swinging censers, towering ceilings with aged murals, flagstones and pillars smoothed with years, chanting priests, male and female choirs harmonizing, gilded icons gleaming in dim light. I think I'm in Georgia for just long enough to want to stay longer. Sure, there are travel warnings issued by the U.S. State Department, but you can always count on the government for overexaggerating to cover their backs. The Georgian tourist maps also state bluntly that there are areas not in control of the government, but they're easy enough to avoid. Hopefully it's just the early season, but it seems that at the moment Tbilisi and Batumi are pleasantly undertouristed. I arrived in Batumi this morning, and I'm going to leave in a couple hours, as soon as the beachside Ferris wheel starts running so I can get a ride before I move on. I've spent the morning strolling around town, happily unburdened of my luggage. The train station was so small that it lacked any sort of bag storage, but I've managed to talk the good folks at the enormous Sheraton into holding on to my stuff. It's a short visit, but better than none, and a perfect example proving that the more places I travel to, the more places I want to see. Ethan Martin is traveling throughout Asia and Europe, and keeping a blog, http://v-w-x.blogspot.com. The 2001 Exeter High School graduate's column on his travels will appear monthly in the Exeter News-Letter. Another architectural design innovation will be installed on one of the building in Tbilisi, Georgia in September of 2011. The external facade of a building in Tbilisi will be clad with Cymat’s Alusion large cell two-sided open panels. Architects.ge's Levan Mushkudiani wanted a new and creative cladding for the project and chose the Alusion panel. The architectural product Alusion would be used to clad a uniquely shaped building in Georgia’s capital, Tbilisi. The cladding would cover an area of 12,000 m2 in a multifunctional complex. The shape of the outwardly sloping building would make it distinct from other buildings in the city. Alusion product metallic luster combined with a variety of finishes, each of which offers a distinctive surface that cannot be exactly reproduced, can add a signature touch to any work of architecture. Cladding product that will be used in Tbilisi is used for many unique modern design solutions. Here is the list of most interesting examples from around the world. The external cladding project in Tbilisi represents Cymat's first order in the region. Valued at more than $700,000, it is the company’s second largest external cladding order. Cymat's President and COO, David Fowler stated that the order marks an important breakthrough for the company to enter into a new region. He added that the order had to be produced and delivered within six weeks for installation in September 2011, and proves the improved manufacturing process of the company. Eduard Saakashvili, son of the President of Georgia Mikheil Saakashvili broke the record for the English alphabet speed typing with his right hand on iPad. Representatives of the Guinness Book of Records, which for this occasion arrived in Batumi, Georgia the officially recorded a new record - 5.26 seconds, which is one and a half seconds faster than the previously set records. As a Guinness Book of Records representative told reporters, Eduard Saakashvili had three attempts, but he broke the record on his first. Saakashvili Jr., who is now 15 years old, said that it did not take long to train, and promised in the future to break his new record using Chinese characters. Sting and Chris Botti performed a magnificent, an unforgettable concert for Georgian listeners on July 3rd, 2011. The spectators were watching the show not only on Batumi Piazza, but the Era Square, on a large screen and by TVs. the concert, which caused endless ovations of the spectators, was concluded with impressive fireworks. Along with his hits, Chris Botti played the music by a Georgian composer Gia Kancheli, a soundtrack from the movie Mimino and caused applauds by Georgian listeners. Soon Sting appeared on the stage and sang five compositions, causing ovations both in musicians and listeners. Luka Nakaidze, 10, was the luckiest last night, because he played on drums with the world stars and even was presented with drumsticks. Georgian Minister of Culture said the concert was very successful and a beginning of the visits of many other world stars in Batumi. Sting was also impressed with the concert. At the briefing held before the show, he said he really wanted to visit Georgia again to learn more about the country. Georgian president attended the concert together with the family. President even talked with the singers before the show. Georgia is a country that wants to move its economy into the new millennium. Not an easy task for a former Soviet Republic that has been in conflict on and off with Russia since the summer of 2008. Despite their country’s troubles, Georgians are a friendly and very hospitable people. According to Selkirk College Business Instructor, Michael Konkin, they want to embrace capitalism but they don’t yet have the know-how or the infrastructure to make a western-style economy work. As well, they are faced with 20 per cent interest on business loans, a prohibitive amount for the small business entrepreneur. This limited understanding of entrepreneurism is what Business Administration students Krys Klimuk and Trent Zoobkoff set out to change, at least a little. On a two-week internship earlier this year, the pair traveled to the city of Tbilisi with instructor Michael Konkin, and two students and faculty from Thompson Rivers University. Their work completed the final stage of an economic development project spearheaded by Selkirk’s International Program and funded by Canadian Investment Development Agency (CIDA). Students and faculty met with a dozen entrepreneurs-from egg and mushroom farmers to car importers-and discussed their businesses and their challenges. Some of the entrepreneurs were also business students at Gori College and Georgian Technical University. One-on-one consultations helped them learn about customer service and about how to tackle their business problems strategically, with an eye to the future. “Georgian business owners find it very challenging to invest in the future. Russian warplanes still fly overhead occasionally, so their focus tends to be on making money right now. They need stability and infrastructure,” explains Konkin. From the students’ perspective, the trip had a lasting impact. “This internship was a great learning experience for me. I had the opportunity to see how business was conducted in another country and I got to help entrepreneurs resolve some of their business issues,” explains Krys Klimuk. Selkirk College offers business programs with international work, study and volunteer opportunities for Canadian students. Visit www.selkirk.ca/ba for details. Summer has arrived and what better way to cool yourself off than with an ice cold beer? Last weekend, Natakhtari Brewery, Georgia’s leading beer producer invited people to quench their thirst with endless beer at the Second Annual Tbilisi Beer Festival 2011 downtown at Rose Revolution Square. People who really enjoy beer and came very thirsty had the opportunity to taste five options of beers from Natakhtari Brewery while enjoying the provided entertainment, food and the company of friends and family. Locally produced fresh beers with brand names like Natakhtari, Karva, Extra, Kasri and Efes, an imported Turkish beer were for sale on taps at the festival. The price for a glass of beer was 1 lari. “We want Georgians as well as foreigners to have an event they look forward to every year and share that it is a great place to live and bring visitors to,” Tornike Nikolaishvili, the Marketing Manager of Natakhtari Brewery told Georgia Today. “[At] this year’s festival we have more space, more beer and large tents that fit thousands of people underneath to sit on hay bunches and have delicious meals that go well with beer,” he added. The organizers hope that people have enjoyed “the truly unique experience,” and hope that the Tbilisi Beer Fest will become one of the most authentic beer events in Europe. “We would like the event to continue growing in vendors and attendance each year. This year we had guests from our neighboring countries including Armenia and Azerbaijan and hope the number of foreign guests will increase in the future,” said Beka Jakeli, the Deputy Head of the National Tourism Agency of Georgia, a state agency responsible for the tourism sector development and one of the organizers of the beer festival. With the aim of getting closer to European beer festival traditions, the tables in Tbilisi were served by the wonderful wait staff of Oktoberfest, the largest Bavarian beer festival in Germany, all dazzling in traditional Bavarian dress. Oktoberfest is one of the most famous events in Germany and the world’s largest fair, with more than 5 million people attending every year running from late September to the first weekend in October. The entertainment line up included the fresh air concert by multi-faceted local musicians such as Salome Korkotashvili, Rodrigues, musical groups – Mgzavrebi, 33 A, Frani, Comic Condition, Nali and Zarebi. Several lotteries and competitions were arranged and the winners were granted beer-related souvenirs. Guests were encouraged to immerse themselves in the spirit of Tbilisi Beer Fest with a range of fun beer accessories that not only provided mementoes to take home but most importantly, provided a plethora of laughs and photo opportunities at the event. For non-alcohol drinkers and children, the organizers arranged the sparkling juice corner where they could sample Natakhtari Lemonade which was presented in a variety of aromas including tarragon, orange, cream, saperavi, pear, lemon and peach. The Natakhtari brewery was built in 2005 with the joint investments of TBC Bank and the European Bank for Reconstruction and Development (EBRD). It also imports Turkish Efes beer to Georgia. Efes International acquired 100% of the share in 2008. Investments made during 2008, 2009 and 2010 respectively amount to 58.4 million lari ($31.8 million). According to the company’s officials, Natakhtari controls more than 60 percent of Georgia’s beer market. “Living in Tbilisi, I don’t have to travel far to find good beer. Here’s why,” said Levani, 31, to Georgia Today, as he held up two beers in his hands.